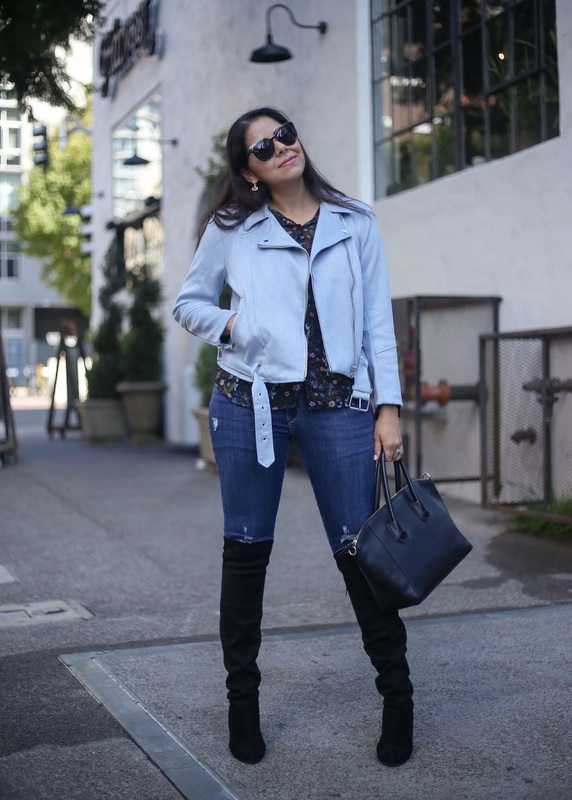 I've raved about moto/biker jackets before but today I'm zeroing in on the suede (or faux suede) moto jackets because they have become a constant go-to for me every Fall and Winter for the last few years. I find that they add such a cool-girl vibe to any ensemble, allow me to show you how! If you don't have a moto jacket and want to try it out for yourself, I recommend starting with a black one and testing its versatility. What I mean by "testing its versatility" is do you notice that you can layer it over your ensembles? Do you wear it often? Are you comfortable in it? For me the answer was yes, yes and yes before I decided to purchase other colors. I would continue to wear each one so much that eventually it turned into a colorful moto jacket collection and this baby blue one is the latest addition. 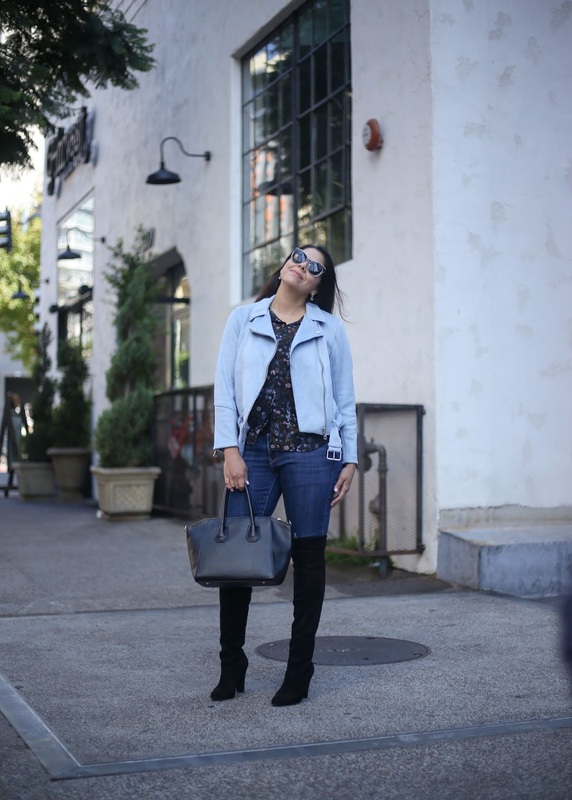 Layer it over a casual look with sneakers like I did in this post (hello athleisure! ), or layer it over a dress like I did in this post or toss it on a top, jeans and over the knee boots outfit like I did here. Be careful to not be too matchy matchy with the boots and moto jacket as it can sometimes be overkill. 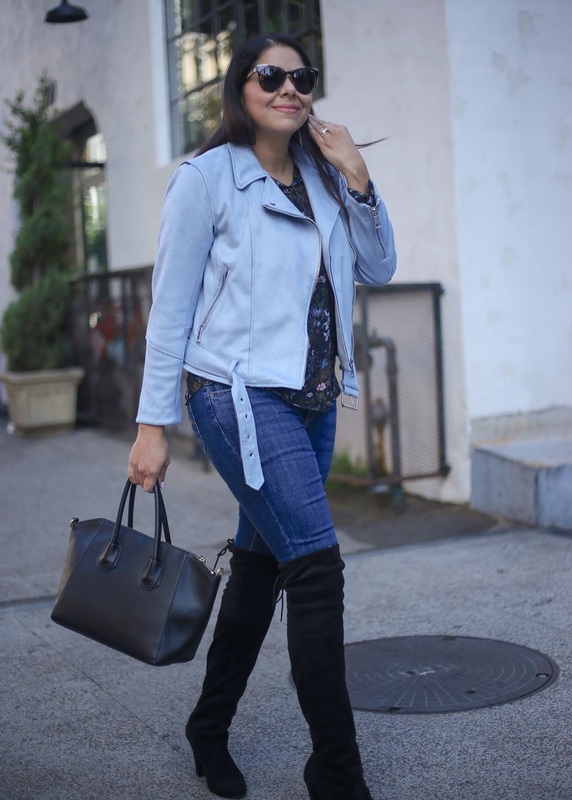 I love the combo of a colored moto jacket and a different colored boot like I did with this light blue one and the black boots. 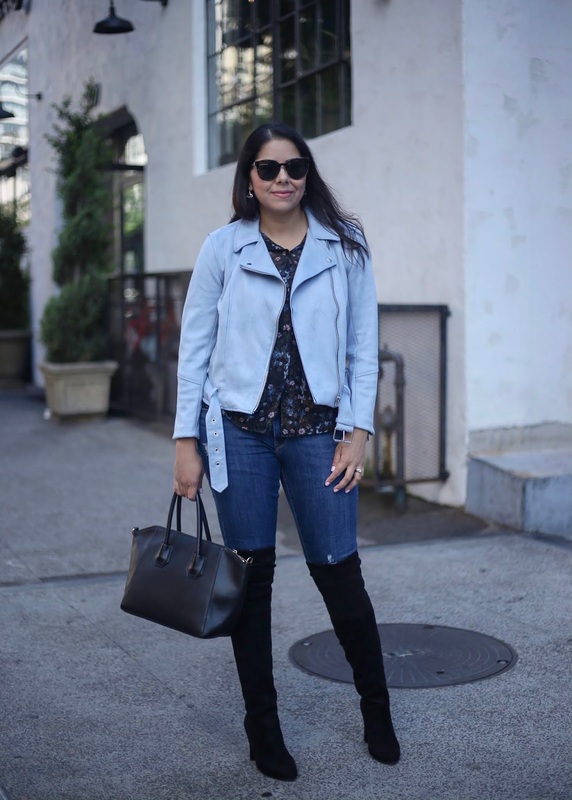 Moto jackets are such a versatile layering piece that I find that I can put together a basic look and with simply adding the moto jacket to it, it makes it so much better. I also typically size up in these types of jackets because I have a bigger chest and I also like it to be a bit loose and comfortable. Where to wear this outfit to? 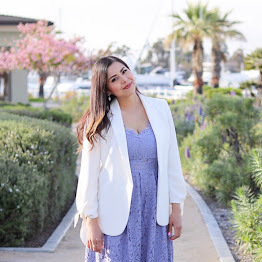 I wore this to a lunch with friends, however it is a great outfit to grab cocktails (and don't want to be too fancy) or even a day-date in Fall/Winter. While some are investment pieces (especially the real suede ones) here are some suede-looking moto jackets that are high quality at a great price point!